The honour came as a complete surprise to the business partners who were at the awards to show their support for local business. The Bott family took a huge leap of faith when they decided to buy a brewery in 1988. The current craft beer explosion was just a dream in those days and the North Staffordshire beer scene was dominated by the big players, such as Marston’s and Ansells. Keith had been in the trade throughout his working life, starting as an apprentice brewer with Titanic which began life as a tiny micro-brewery at the back of the Travellers’ Rest pub, Middleport, on the outskirts of Burslem. Keith was honoured with an MBE two years ago for services to industry and the Staffordshire economy and has served as Chair and President of SIBA. “Titanic Brewery was a superb little business and was run with passion by its founder John Pazio,” said Keith. “It hit hard times and John had to give it up. “The Sentinel Lifetime Achievement Award is an amazing honour and we have to thank everyone who has played a part in the Titanic story. It has been a fantastic journey and we have made many lasting friendships along the way..
Dave outlined growth over the years at Titanic Brewery. 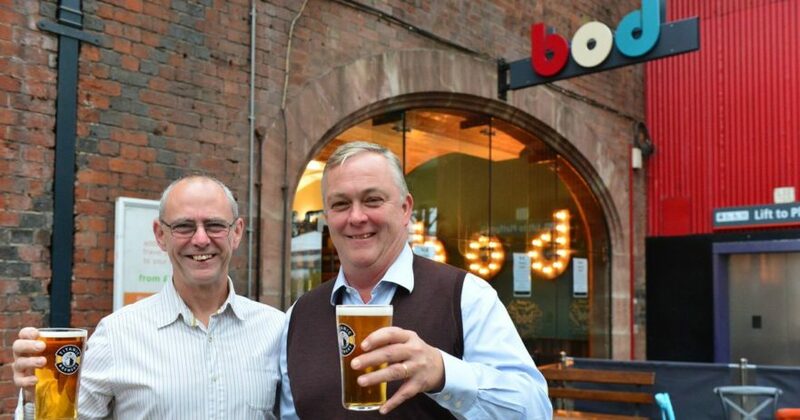 “We have expanded our pub fleet and are currently rolling out our caf頢ar concept called bod. This started in Bodmin Avenue, Stafford, proving remarkably successful with our largely local clientele. We then rolled it out into North Staffordshire when we took the opportunity to take on the former First Class lounge at Stoke Station and we are now developing a bod in Trentham and have a fourth in the pipeline at Newport, Shropshire. Titanic has gained a dual reputation, for award winning beer and for developing its own estate. The brewery pioneered an idea to reinvigorate shut down pubs, working in partnership with larger estate owners. This has now become more common across the UK and has led to an explosion of locally branded pubs. Titanic Brewery’s beer has led to many major awards, including a Gold medal in the Champion Beer of Britain competition for its popular Plum Porter ale. Dave said: “The Lifetime Achievement Award is an amazing honour and we have to thank everyone who has played a part in the Titanic story. It has been a fantastic journey and we have made many lasting friendships along the way. The Sentinel Business Awards are hosted by the Sentinel newspaper. Based in Stoke-on-Trent, the Sentinel covers an area spanning much of Staffordshire and Cheshire and the annual business awards are regarded as a pinnacle of achievement for the local business community.